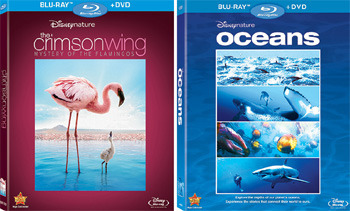 On October 19 Disney Nature released two amazing new movies on DVD and Blu-Ray: The Crimson Wing and Oceans. The first one if about the mysterious pink flamingo, and the second one is about our planet’s amazing blue oceans! You may be asking, what’s so mysterious about flamingos? Think about it – how do these birds, who are born pure-white, get that red/pink color? Here’s the answer (and don’t worry – we’re not giving away any secrets about the film): Lake Natron in Northern Tanzania is very shallow and also very poisonous due to volcanic activity nearby. The toxins make the lake turn blood red. But when the rains come, the lake is filled with water and the water is filled with algae. That’s when hundreds of thousands of flamingos flock to the lake to feed and mate. They eat the algae in the lake and turn red/pink. The more each flamingo eats, the brighter in color he/she gets! 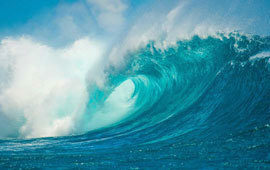 This is a very, very cool documentary movie about the world’s oceans, and we think you’ll learn a lot from it! There’s footage of all sorts of sea life humans have never before seen – in fact, it took the makers four whole years to capture all the footage and put it together! They used some pretty cool technology to get the underwater footage, including something called a torpedo camera, which actually looks enough like a fish that it doesn’t scare away any sneaky little swimmers!